Classes of membership: Full membership £6 per annum. Members must also hold BCA insurance either taken out through the Group, or by another channel (CDG or other caving club). This is an additional £18 for standard underground insurance. Temporary membership (17 days) £10. This includes 17 days BCA underground insurance, for guided underground tours. Artefact collection: Some artefacts on show at the Amlwch Industrial Heritage Centre Tel: 01407-832277. 0pen seasonally. Current projects:	 Negotiating leases for the Parys and Mona mines. Publicity: Heritage Trust leaflets for marked surface trail can be downloaded from http://www.copperkingdom.co.uk. Underground information sheet available on request via Group website. Services:	 Microbiological/mineralogical and geochemical analysis. This mine has a proven history of 4000 years of copper mining. Bronze age sites and tools have been found underground. 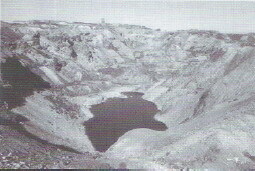 In the 18th century the Parys mines under Thomas Williams dominated the world market in copper.